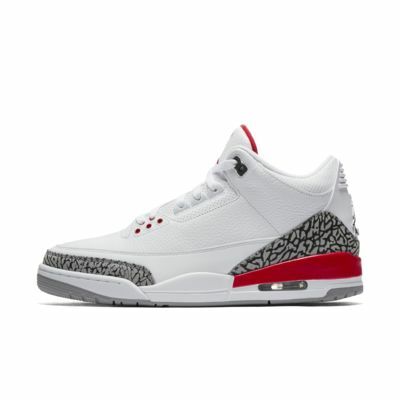 The Air Jordan 3 Retro Men's Shoe features lightweight, visible cushioning for the comfortable fit of the original. Leather provides durability, and signature details celebrate the game-changing icon. The Air Jordan 3 Retro Men&apos;s Shoe features lightweight, visible cushioning for the comfortable fit of the original. Leather provides durability, and signature details celebrate the game-changing icon. Since his game-winning shot that brought the National Championship to North Carolina, Michael Jordan has been at the forefront of basketball consciousness. He took the court in 1985 wearing the original Air Jordan I, setting a new standard for performance and style, simultaneously breaking league rules and his opponents&apos; will while capturing the imagination of fans worldwide. Ever evolving, ever at the pinnacle of imagination, the Air Jordan line is the ultimate in basketball footwear. Great colorway to add to your collection. These will look great in the late summer and early fall on college campus! Great shoes, Great fit!!! The shoes Feels like they did in the 90’s!! !